When I was accepted at Brighton it was exciting, seeing that my plan I had outlined to my parents to quit work and go study was becoming a reality. Honestly I can say it’s what I hoped for which is a great thing to say. I want to be a Game Developer and the programming and computer science definitely goes towards equipping me to pursue that. There is still legwork to be doing with networking though and building my own portfolio, can’t be hand held the whole way! I would recommend the course and I’d recommend talking to your peers, organising projects and just jumping into things. Everything seems daunting when you’ve not tried it before and mistakes are a natural part of that so try get them out the way now while you have so much support. Talk to your lecturers, ask questions and make use of their experience. Richard Leinfeller has been fantastic along with Panagiotis Fotaris. They have both been instrumental in helping us set up the Game Jam Soc. Their enthusiasm to see us go out and make games has been very encouraging. For me the highlights of the course have got to be Game Jams. The course is aimed at equipping you and it’s these extra-curricular activities that really help you contextualize what you’ve learnt and see how you can use it. Through out of class activities I’ve been able to meet some great local Game Devs and talk to them about the industry and network. If you see a talk from an outside speaker pop up definitely go! We attended an expo in London called IP Expo. It’s more focussed on IT Security but it’s well worth going. I got to attend seminars on hacking and IT Security which may not relate to being a Game Developer is definitely an interesting topic. Also we recently hosted a UKIE Game Jam where we had five teams of 4-6 marathon making a game in around 30 hours. That was an experience, it was so good seeing other people’s ideas go from concept to reality in such a short time. There were some first years who attended that went from never using the software to shipping a game. I definitely intend to do a placement year. 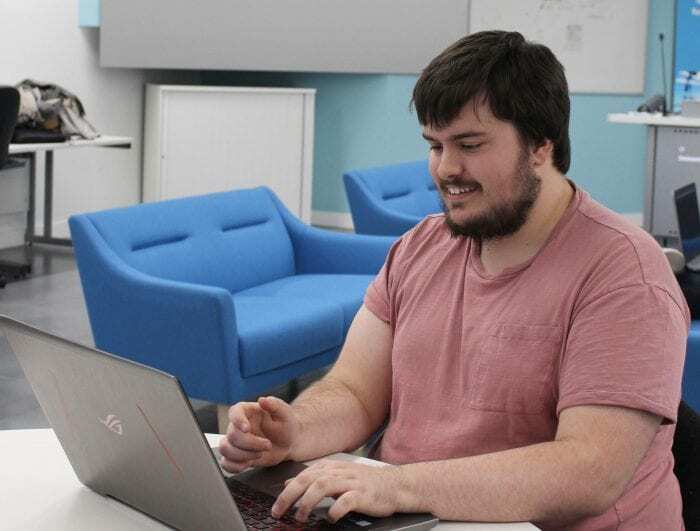 Being in the games industry is about connections and experience and a placement year is a great way to get both while you’re still technically a student so there’s realistic expectations. I hope to land myself working on a games team dealing with design, level design and a healthy dose of programming. It’s been good to move to the UK and live in a city and experience a different way of life and perspectives. I like Brighton because it’s a nice open city with always plenty to do and see, there is a great local dev scene here with weekly coffees for Indie Devs to meet up and network. My course has equipped me to start building a portfolio and with that and my degree I feel like I’ll be a strong candidate for applying for my first jobs in the industry. My advice for anyone thinking of applying? Go for it. You will succeed the most by being driven and just jumping in. This entry was posted in Computer science, Digital media, Games, Life at Brighton, Uncategorized, Undergraduate.